Enjoy beautiful white clusters of flowers. 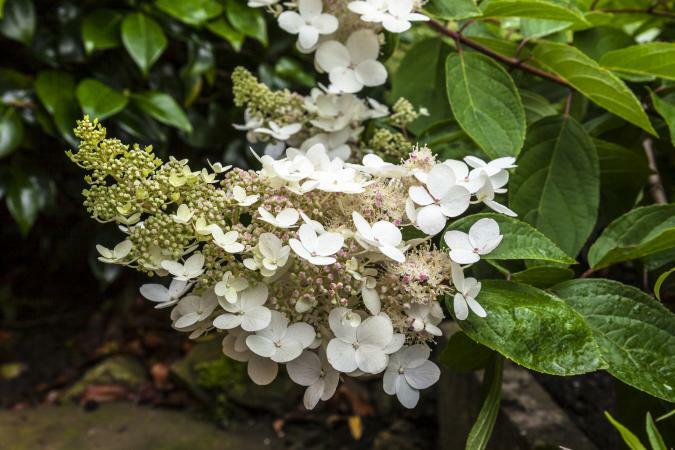 The most cold-hearty of all hydrangeas, the Pee Gee hydrangea is a type of paniculata hydrangea. Often though, nurserymen will refer to all paniculata as Pee Gee. Its botanical name is H paniculata 'Grandiflora' (P. G.). Pee Gees are an old variety that is easy to grow in zones 3 through 8. They prefer full sun to partial shade and mildly acidic to neutral soil. Many landscapers are tired of this variety (some saying the best place for it is in the compost heap!) but it is still a great variety for colder climates where other hydrangeas just can't grow. Pee Gee is a large shrub averaging six to eight feet tall, with some getting up to 20 feet tall and 20 feet wide if left wild. This variety produces cone shaped flower clusters as opposed to the round clusters of most other varieties. Flower clusters typically grow up to 18 inches long and 10 inches wide. Pee Gees bloom from mid- to late summer through early fall. Flowers start out white; as they age they turn pink and then rust colored in the fall. Often the flowers are dried for beautiful indoor arrangements that can be enjoyed year round. Traditionally, Pee Gees are a border shrub. However, this shrub can also be pruned into a single stem to form a small tree. Propagation is typically from cuttings since the plants are sterile and produce no seeds. Pee Gees should be planted in moist, rich, well drained soil. When planting your Pee Gee, the crown--where the stem meets the roots-- should be placed just below ground level. Planting deeper can cause the roots to rot. Once the shrub is placed in the hole, tamp soil down around it and water. It is a good idea to mulch your Pee Gee to help the soil to retain moisture. It should also be fertilized with a light fertilizer in March, May and July. If you are creating a border with your Pee Gees, they should be planted 12 to 15 feet apart. When they bloom you will have a show-stopping display of blooms that will brighten the entire neighborhood. You can also plant smaller flowers under your Pee Gee to add even more color to your border. An advantage of using Pee Gees as a border-besides the beautiful display that they provide-is that deer tend to avoid them. This is great news if you tend to have deer problems. This very adaptable shrub is fast growing, with growth of 25 inches or more each year. Because blooms form on new growth, it is a good idea to prune your Pee Gee in the winter, as well as removing dead flowers as needed to keep this shrub looking fresh and lovely throughout its flowering season. The Arbor Day Foundation - Just one of many flowering trees and shrubs, Pee Gees can be ordered by anyone. If you are a member, you'll get a discounted price. Horsford Gardens and Nursery - A nice selection of hydrangeas are available here including the standard Pee Gee and a compact variety. Even though many garden experts have less than glowing opinions of the Pee Gee hydrangea, it still is a very garden worthy shrub; especially so if you live in colder climates. Try one and see for yourself the beauty that it lends to any landscape.